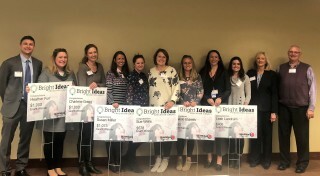 Exciting, hands-on learning projects are coming to local classrooms thanks to $5,849 in Bright Ideas grants awarded recently by Blue Ridge Energy to local educators during a special luncheon honoring winning teachers and their principals. Chris Watson of Valle Crucis School for “The Gift of Song!” This $1,200 grant will aid chorus classes with new choral literature for all eight middle schools in the county. The new literature will be used in Watauga’s very first all-county chorus presentation. Chelsie Eldreth of Bethel Elementary for “Creating with K'Nex.” The grant for $593 will purchase K’nex kits for 6th-grade students to construct cranes and buildings and to understand how to build structures that could withstand the forces of earthquakes or hurricanes. Susan Miller of Parkway Elementary for “Social Studies Concepts—Life in the Ancient World.” This $1,073 grant will purchase non-fiction books so students can research various civilizations in the ancient world. Concept learning allows students to make meaningful connections between their life and people that lived in the ancient world. Leah Landrum of Green Valley Elementary for “Bringing Our Garden to Life.” The grant for $405 will help obtain materials needed for students to engage in planting, maintaining and harvesting in the school garden. Sue Wells of Hardin Park Elementary for “Sensory Backpacks.” This $578 grant will help younger students who suffer from sensory processing issues. These students need materials to help them stay calm and focus on goals and academics. Sensory backpacks may include: headphones, skin brushes, therapy putty, and weighted vests or lap pads. Charlene Gragg of Marjorie Williams Academy for “Emerging into Reading with Decodable Books for MWA K-1.” The $1,000 grant will purchase a book series of 41 richly illustrated, engaging, and meaningful decodable readers tied to a cumulative systematic phonics scope and sequence. Heather Furr of Banner Elk Elementary for “Green Thumb Gardening.” The $1,000 grant will get students thinking about the origins of their food in an outdoor gardening classroom. Blue Ridge Energy received 81 applications for the 2018-2019 school year from schools in its service area of Caldwell, Watauga, Ashe, Alleghany, Wilkes and Avery counties. Funds totaling $22,499 were awarded to 26 classrooms to benefit hundreds of local students. To date, Blue Ridge Energy has awarded more than $469,000 in Bright Ideas classroom grants that has impacted over 100,000 local students and teachers. Blue Ridge Energy is part of several North Carolina electric cooperatives providing Bright Ideas grants. Together, they have provided more than $11.5 million for classroom projects impacting over 2.2 million students in North Carolina. Blue Ridge Energy is a member-owned electric cooperative serving some 76,000 members in Caldwell, Watauga, Ashe, Alleghany, Avery, Alexander and Wilkes counties. To learn more about the Bright Ideas grants program, visit Blue Ridge Energy’s web site at www.BlueRidgeEnergy.com or contact your local Blue Ridge Energy office.